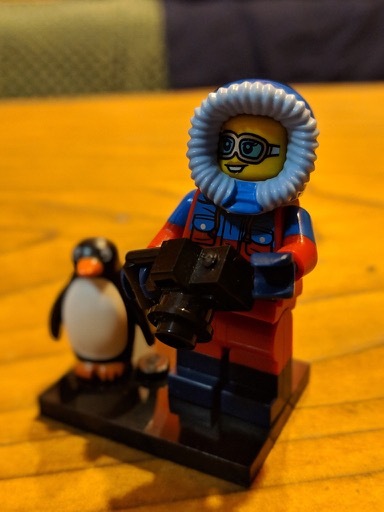 This little lego figure is PolarTREC Polly. She is hidden here in McMurdo and her location is known only to PolarTREC teachers! Bridget Ward, a fellow PolarTREC teacher, who had her Weddell Seals: Growing up on Ice, expedition delayed until 2019, had a great idea that she was going to implement when she got to McMurdo Station. 2019-20 PolarTREC teacher Bridget Ward (Weddell Seals:Growing up on the Ice project) came up with the idea for "PolarTREC Polly." 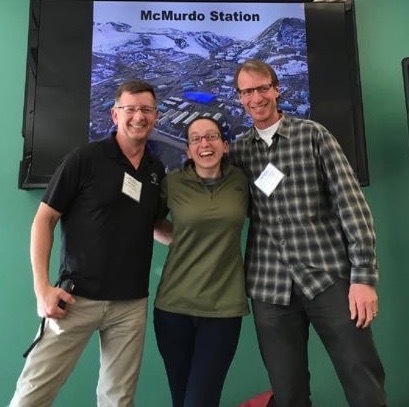 Bridget came up with a way to connect all PolarTREC teachers who travel to or through McMurdo Station in Antarctica in the future. 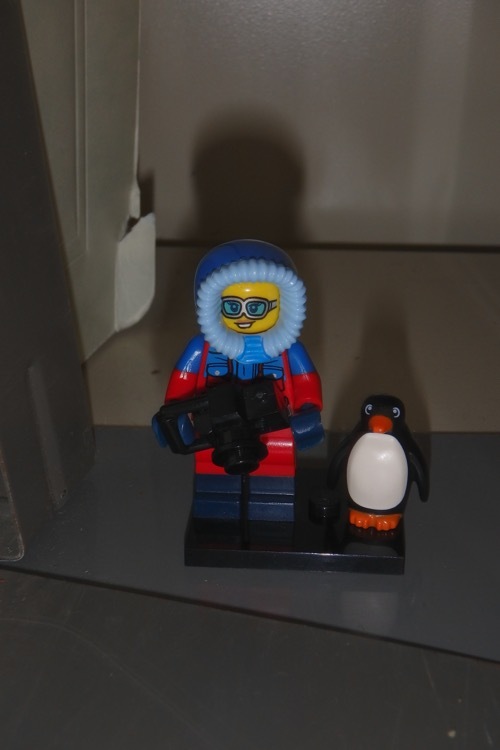 The idea is that this little Antarctic Lego woman will be hidden in a secret place, somewhere in McMurdo Station. The hidden location will only be known to the PolarTREC teachers. Each teacher who deploys to or through McMurdo will find “PolarTREC Polly” and get their picture taken with her and sign their names, project and year and put her back for the next teachers to find. Year after year. The 2018 PolarTREC McMurdo based teachers (Mike Penn (left), Bridget Ward (center), Kevin Dickerson (right) seen here at PolarTREC Orientation in Fairbanks at the University of Alaska-Fairbanks. 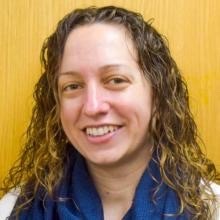 There were five PolarTREC teachers originally scheduled to go to the Antarctic during the 2018-19 season. Sadly two of our group couldn't participate this year due to some unforeseen medical and logistical problems. Bridget Ward was one of the teachers (the middle of this picture) who is delayed until next season. Bridget will be working with the Weddell Seals: Growing Up on Ice project in 2019. Also seen in this picture is Kevin Dickerson (right hand side). Kevin will be down into Antarctica with his project Dry Valley Ecosystems Study just after I leave in late December. And that leaves me on the far left of the picture. Since Bridget was delayed until next year, I was tasked with hiding PolarTREC Polly for the first time. 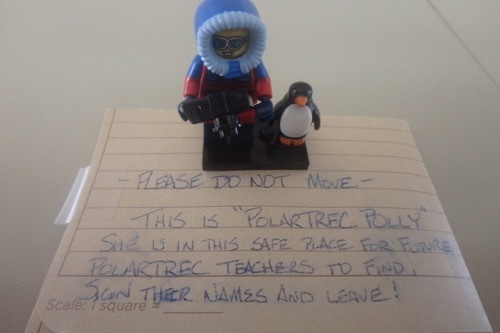 I hid PolarTREC Polly in a place that I thought all PolarTREC teachers would have access to. And also in a specific place that isn't frequently accessed so that she is unlikely to be noticed and moved by some well-meaning, but unknowing person. PolarTREC Polly is now hidden in an undisclosed location, somewhere in McMurdo Station, Antarctica. PolarTREC teachers will sign their names, projects, date and hometowns and leave her for the next teacher to find! I am so excited to actually meet P.P. I will be sure to check in with her. I am sure she has much gained knowledge, experience, and wisdom that I can gain from visiting with her. As with all LEGO figures, the best way to find PolarTREC Polly is to walk around in the dark at night in your bare feet. And that brings up a question I have: does the sun go down at night at McMurdo station? How much further south do you need to go before you get the never-setting sun in summer? Also, how do time zones work in Antarctica? Is it just like the rest of the world, with the zones becoming increasingly narrow as you approach the south pole? I imagine that would be quite confusing when working near the south pole. Gary, inside the Antarctic CIrcle the sun doesn't set in the "summer" here, so the next sunset here will be on February 20, 2019 01:46 AM! Both McMurdo (where I am) and South Pole Station (where I'll be on Saturday) is on New Zeland time (+18 hours). But, you are correct, in order to avoid the confusion of increasingly narrow time zones we just use one since it is daylight 24/7. I am looking forward to walking "around the world" at the pole, and stepping from today into yesterday into tomorrow at the pole.